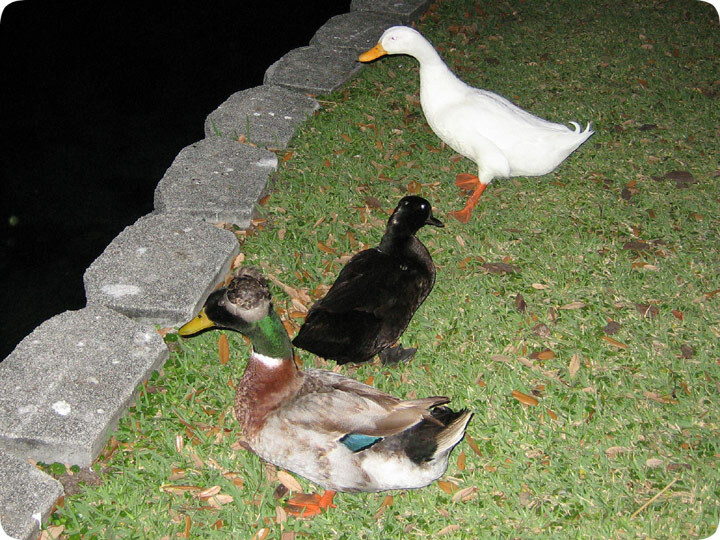 10.10.2005 - I took this duck photo at Lake Eola. Ducks are welcome at Lake Eola, and no one that I know of is attempting duck removal there. However, I have been called several times for duck removal. Most commonly, this is when ducks have taken up residence in a person's pool, and will not leave. I will describe two scenarios in which I performed successful duck removal. The first was for a homeowner whose personal pool became the personal home to a mating pair of Mallard Ducks. The ducks would not leave the area. They had not established a nest, but they had chosen the pool as their home. The homeowner chased them away every day, but to no avail. They had decided to stay. I came in and caught the ducks in my large duck net, and relocated them to a pond twelve miles away. Alas, within a couple of days, they had returned. I donated the ducks to the Sanford Zoo, where they clipped the wings so that the ducks couldn't fly away, and there they stayed, fed a nice diet and given a nice home. The second case involved a mother duck and her ducklings who decided to live at the pool at the Hard Rock Hotel in Universal Studios. Bad nesting choice. The poor mother duck ushered around her little brood in the extremely crowded and loud environment. I was called in, and found dozens of people gawking at and harassing the ducks. The pool was very large, and very public, and I had about 100 gawking onlookers staring at me as I netted the mother duck and all of her young. It was not an easy process. Invariably, some people offered to help and couldn't help themselves but to help, which wasn't really much help to me. Then of course about 50 people gave me stern looks and yelled at me not to harm the precious little ducklings. I did not. I relocated the whole brood to a new pond, and since the young could not fly, the mother established a new home for them there, one much better than a busy tourist hotel based on loud rock music. I checked up on the ducks a week later, and found them enjoying their quiet and peaceful new home. The end. Do it yourself: Visit my How To Get Rid of Ducks page for tips and advice.